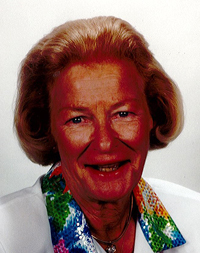 Beverly Hanson Sfingi, 89, passed away on April 12, 2014, in Twin Falls, Idaho, from complications of Alzheimer’s and COPD. Beverly was born in Fargo, N.D., on Dec. 5, 1924. She graduated from the University of North Dakota at 19 years of age with a degree in journalism. Upon graduation in 1944, Beverly pursued a journalistic career with the Fargo Forum. In 1947, Beverly decided it was time to follow her heart and pursue a career in golf. In 1950, Beverly was selected for the Curtis Cup team and posted a three-win, no-loss record. Also in 1950, she won the U.S. Amateur Championship at East Lake Country Club in Atlanta, Ga., and was honored to have Bobby Jones present her with the winner’s trophy. Beverly turned pro in 1951 and joined the LPGA Tour, winning her very first event. To date, she remains the only professional to do so when she won the Eastern Open, just six days after turning pro. In her 10 years as an LPGA touring professional, Beverly won 17 tournaments, which included three majors: the inaugural LPGA Championship in 1955, the Western Open in 1956 and the Titleholders in 1958. She was the leading money winner and a winner of the Vare Trophy for the lowest scoring average in 1958. After Beverly’s retirement from the tour, she was the women’s golf instructor at Eldorado Country Club in Indian Wells, Calif., for 35 years, a founding member of California Women for Agriculture and active in church and community affairs. She also served two elected terms to the Desert Sands Board of Education. In 1961, she married Andrew J. Sfingi. They were married 34 years and together they adopted three children: Sharon, John and Jay. Beverly is survived by her sons, John Sfingi of Jerome, Idaho, and Jay (Mary) Sfingi of Hailey, Idaho; and two grandchildren, Megan and Caitlyn. Beverly was preceded in death by her husband, Andrew Sfingi; infant daughter Sharon; mother Mildred Hanson; father Harold Hanson; and her brother Gordon Hanson. The funeral service will be held at 10 a.m. April 25 at St Margarets Episcopal Church in Palm Desert, Calif. Rosenau Funeral Home in Twin Falls, Idaho, and Fitzhenry-Wiefels Funeral Home in Indio, Calif., are handling the funeral arrangements. In lieu of flowers, memorial donations may be given to California Women for Agriculture (1521 I St., Sacramento, CA 95814) the Hospice of Twin Falls (1770 Park View Dr., Twin Falls, ID 83301) or a charity of your choice.